The Dane County New Teacher Project (DCNTP) brings guidance, training and support to school districts as they develop new teacher induction programs. Formed as a pilot project in 2002, the DCNTP is a consortium of districts that collaborates to meet and exceed the induction and mentoring requirements of PI-34. We are led by Board Members and District Council Representatives who are carefully selected from among teachers, administrators and district office personal to represent well the broad range of differences in Dane County. We know that district needs differ greatly depending on their size, location, and mentoring models, and our Board and District Council helps us to build strong induction programs within and across districts. The DCNTP is above all a learning organization, and we’ve learned with and from our member districts, from local and state professional organizations, and especially from the New Teacher Center (NTC), a nationally recognized induction organization. Recognized nationally and internationally, NTC provides exceptional training and support programs that dramatically improve retention rates while accelerating the practice of new teachers, mentors and principals. A Beginning Teacher Seminar series, providing just-in-time learning for our newest colleagues. These seminars offer strategies for immediate classroom use, offer PDP support, enhance knowledge of WTS Standards and Danielson’s Domains and provide opportunities to connect and learn from other beginning teachers across our consortium. District Induction Team Work Day which supports district induction teams to strengthen their induction programs to enhance mentor growth and beginning teacher acceleration. Helps to guide program mission throughout the year. Release Mentor Forums to support the unique needs of those working with multiple beginning teachers. Principal Breakfasts that encourage administrative support for induction programs. Program Leader Coffees to support our district’s program leaders in developing high quality induction programs. 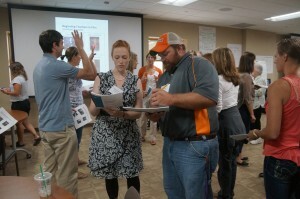 Menu of Induction Related Site Visits extend learning beyond DCNTP District Council Meetings. Induction leaders can attend and observe a variety of induction programs occuring within our districts and apply their learning to their own settings. Menu of potential in-district Mentor PD offerings and activities for districts to best support their 1:1 mentors. Quarterly District Council Meetings where two Induction Program Leaders from each district share best practices, induction tools and resources and problem solve related to district induction and mentoring needs. Also receive state and national updates related to induction such as Educator Effectiveness and principal and mentor communication. Focused, in-district consultations tailored to the assessed needs of individual districts, and facilitated by Tom Howe, DCNTP Chair and Senior Program Consultant, New Teacher Center. Scholarships for selected DCNTP members to attend the National Teacher Induction Network (NTIN), where more than 30 induction programs from across the nation come together and share their successes and challenges. Scholarship for a selected DCNTP member to attend the New Teacher Center’s Annual Induction Symposium in February, the largest conference in the world dedicated solely to induction and mentoring. Discounted professional development fees to attend New Teacher Center’s Mentor Professional Development series, specially adapted for Wisconsin Teacher Standards. Please contact Heather Lott for additional information.